The comprehensive tool to retrieve, organize and rapidly access stock quotes in financial databases all over the world. IQFeed®, Yahoo Finance, MetaStock®, CSV, TC2000®, Microsoft Access® and Microsoft SQL Server, IBM DB2, Oracle®, proprietary Time Series storage. Stock Explorer® is the ultimate one stop solution to organize and easily maintain financial data such as stock quotes, sales statistics and any other collections of ordered quantitative observations having the time series nature. 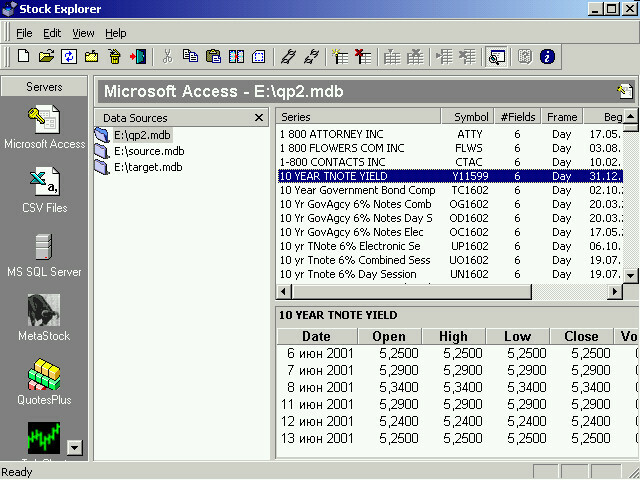 Stock Explorer® supports all major industry standards for data formats including read-write support for the latest versions of Equis MetaStock® files, CSV text worksheets, TC2000® and QuotesPlus® data warehouses as well as own native SQL drivers to Microsoft Access® and Microsoft SQL Server which enables easily create and maintain own data storages of almost unlimited capacity with one mouse click. Persistent table linking with the powerful automatic update procedures enables for seamless synchronization from real time feeds as well as easy change of data provider on the fly. Stock Explorer® offers unified and remarkably easy to use point-and-click interface to access completely different data sources thus isolating the user from all complexities of heterogeneous data access in mixed environments. The drastic difference of Stock Explorer® from other similar tools lies in its unique flexibility due to extensible architecture based on SQL standard and original data manager. In this way Stock Explorer® is not bound to certain data format (including, in fact, its own) but allows for the use of many formats simultaneously. In particular, it does not introduce any predefined bar standards as, for example, MetaStock® and allows you freely extend or narrow stored data fields as necessary. To observe this universality you can make easy experiment preparing with Stock Explorer® the sample database in *.mdb file and then easily discover well formatted tabular data in Microsoft Access.